I joined Red vs Blue shortly after I started playing Eve, and I flew frigates worth less than 1m isk total. In spite of my ships being ridiculously cheap, I was almost completely broke within two weeks. It's hard to establish a reliable source of income when you're part of a permanent war, so I left the corp and spent a few weeks running L2 & L3 missions in a Caracal and a Drake. As much as I like Eve, the PVE aspects of this game are really BORING. I absolutely hated running missions, so I've stopped doing it, but this did net me a couple hundred million isk which was enough to get me started and ultimately become self-sufficient. 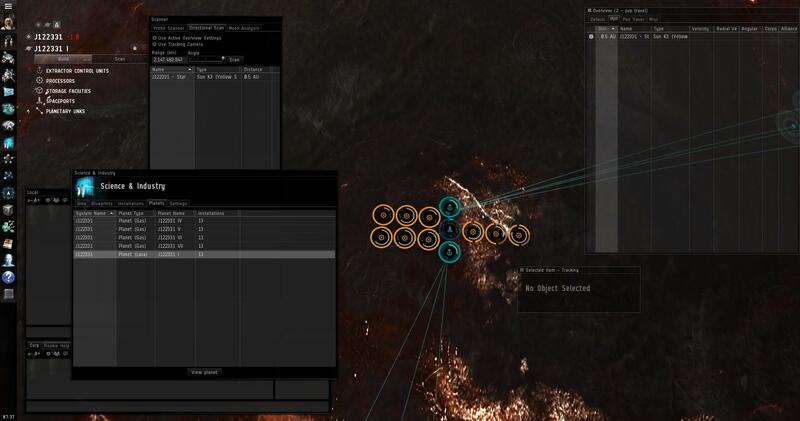 I know now that a single week-old character can make more than 10m isk a day with virtually no time and effort by doing PI extraction in a wormhole. I started doing this as an experiment, mainly because I knew absolutely nothing about wormholes or PI (and I wanted to learn about both), but also to pick up some extra isk in order to help bankroll my recent purchases of a link Loki and a Freighter. Next, I cruised through high-sec and scanned every anomaly I could find, hoping to find wormholes. The goal was to find a system in w-space with a high-sec static exit. You can identify the type of wormhole by looking up its name in this chart, or by jumping through the wormhole and looking up the system name on staticmapper to see what type of static exits the system has. A w-space system with a high sec static will ALWAYS have a wormhole leading to a high-sec system. The existing one will despawn after about a day, and will be replaced with a new one leading to a new high-sec system. This is important for logistics: you will eventually have to get your extracted commodities OUT of your wormhole and to a high-sec trade hub. Basing out of a system with a high-sec static makes this much, much easier. You get the best of both worlds: access to high-yield planets which are comparable to those found deep in null sec space combined with access to high-sec systems only one jump away. I only had to explore a few high-sec systems before I found a system with a B274 wormhole, meaning that I was in a C2 system with a high-sec static exit. The other consideration I had was the tax rates on the customs offices, which were 7.5% in this system. I suspected that I could probably find a better system, but I'm lazy and figured this would be good enough. I moved my two characters into the system, flying Epithals fit with cloaks and core probe launchers, and safely logged them off. Over the course of the next week, I logged them in periodically and checked d-scan to see whether there was any activity in the system. Every time I checked, the system was dead. Perfect. The planet extracts two P0 commodities, refines them into P1 commodities in the basic industry facilities, then refines them into a single P2 commodity with the advanced facilities and transfers them to the launchpad (which I use for storage). The particular setup shown above extracts Non-CS Crystals and Heavy Metals and manufactures Consumer Electronics. The setup is designed for maximum laziness. Once it is set up, all it requires is that I periodically spend about 5 minutes restarting my extractors to make sure everything keeps running. It takes about 2-3 weeks to fill up the launch pad, and the volume is low enough that everything can be easily hauled out in Epithals. I also came to realize that a few planets were not running optimally; I could extract different commodities and make quite a bit more. Still, 169 million isk for about an hour (total) of managing extractors isn't bad. Unfortunately, this story doesn't have a happy ending. The corporation who owns the customs offices in my system decided to raise their tax rates from 7.5% to 85.5%, so I had to shut everything down and move on. Such is life. I've since learned that setting up factory planets is far more profitable, so I think that's the direction I'm going to take. New players: if you're space poor and bored with mining, then consider doing PI. This is a completely PASSIVE income stream. One could nearly plex an account by using the two extra character slots to do wormhole PI, and supplement this income by ratting or running missions on his main. This is particularly great for new players because it requires very few skill points and almost no capital to get started.